Everyone knows how to start an argument but do you know how to end it? 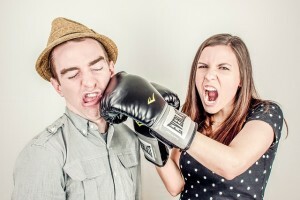 Knowing when and how to terminate an argument is crucial to your ongoing marital bliss. Of Course gaining tools how to fight is important, however this blog features the end phase of an argument. An argument should not be on going but instead have an end. A good rule of thumb is to not let it go longer than an hour. That is plenty of time for a specific issue to be addressed and resolved. When arguments go past that point they usually head into different directions. You start fighting about parents and end with finances. Stay on point and keep it brief. The following is a list of ways to end arguments in productive ways. 1. Find a happy medium, there must be something you agree on. Use the common denominator as your starting point for friendly negotiations. 2. Take turns giving in. Learn what issues are important to your partner and why. Next assess how important is this issue for you and consider letting your partner “win”. 3. Apologize either because you feel you are wrong or as a bridge to move on. 4. State what you would like to see happen and ask if your partner is able/willing to comply. 5. Use silly nicknames or make a joke. Couples who lightly tease each other during a conflict wind up feeling more in love when the disagreement finally blows over, according to a study conducted at the University of California at Berkeley. 6. Suggest a timeout as a way to manage your emotions and sort out what the real issue is. 7. Own your contribution to the argument and offer/solicit solutions. 8. “Research has found that unhappy couples tend to repeat themselves out of desperation to be heard, which isn’t productive. They wind up talking at each other instead of having a dialogue,” says Benjamin Karney, Ph.D., co director of the Relationship Institute at the University of California at Los Angeles. Stop talking and reach out physically to one another. 9. And as a last resort agree to disagree.